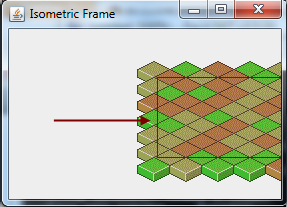 Java-Gaming.org > Game Development > Newbie & Debugging Questions > [SOLVED] Drawing isometric tiles inside a screen ?? 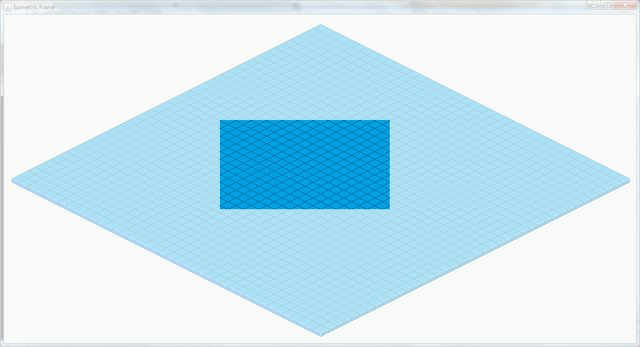 [SOLVED] Drawing isometric tiles inside a screen ?? Isometric games are practically no different in how these maps/rooms/worlds are stored. The most notable difference is, of course, how these maps/worlds appear on screen. This is achieved through different projection. I.e, the same 2d Array, just viewed differently. This is mostly done by turning the tiled map 45 degrees in either direction and substituting the tile with a new isometric tile image. There are different ways and styles on how you can draw isometric tiles. However, this doesn't matter in calculations. What matters is the width and height of the isometric tile. NOTE: Not always the same as the Images width or height. Here we have a Sprite/Image of a pink isometric tile that is 34 pixels wide and 17 pixels high. However, this tile's intended Width and Height are 32 and 16 respectively. Notice the jagged lines that are produced when using the Images Width/Height instead of the intended Isometric Tile Width/Height. 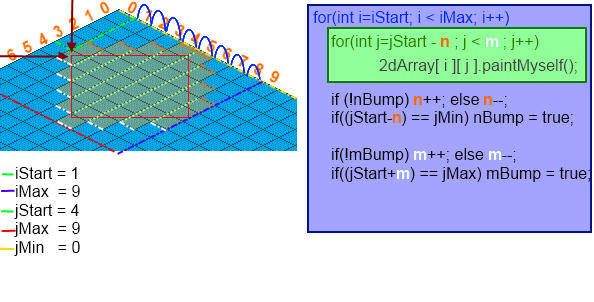 Let's start by going through the array and figuring out the isometric coordinates. We will calculate the isometric position of the blue (Top Left) corner for each tile. Let's insert the isometric projection into a coordinate system and see what conclusions we can draw from it. In this case we have a screen whose Top Left corner points to a tile (pink!). Now even if the screen moves around a bit, the Top Left corner still points to the exact same tile! How do I make sure to draw only the tiles within the screen as to not waste memory cpu (less iterations)? 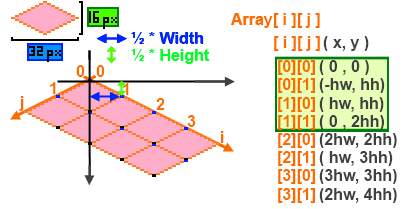 The map is stored in a 2D Array. I've fiddled around with my own solution for days now and it just doesn't work. I need some fresh ideas. Re: Drawing isometric tiles inside a screen ?? You will need to iterate over an axis-aligned rectangle overlaying your original 2D-array. Then for each tile in the axis-aligned rectangle you will need to check to see if it is on-screen or not. The number of visible tiles will be less as they are a diamond within your axis-aligned rectangle. Both the iteration and the on-screen check is easy to do and speedy. I don't understand how and where you think you'll be able to save memory. "You will need to iterate over an axis-aligned rectangle overlaying your original 2D-array." Pick an "estimate" box of values (small array) from the BIG 2D-Array. Iterate through this "estimate" smaller 2D-Array and check each iteration if this element is inside or outside of the Screen. Find the tile position of the tiles in the corners of the screen, then draw the map line by line between these positions? Warning: I wrote that when posting. Not tested at all. In my code I also use a Buffer variable when they reach the min and max points in the j position. So that it doesn't immediately start decreasing, only until the buffer is gone. I've tried commentating as well as possible. 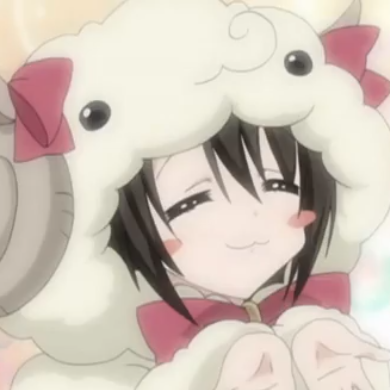 // and are now moving back. I have a hard time debugging code for you in my head. Either do the debugging yourself or post something I can run. EDIT: You should only have the paintAll calls in the inner loop. That is most likely your problem. You want to check for bouncing every y, not for every x.
Duhh, of course! I even had the adjustments schedules for the outer loop in my picture, and even so I went head and included it inside the inner loop. Thanks! Your method works perfectly! [EDIT]: I've no time now to clarify but it works quite flawlessy with a few tweaks - I'll the solution more in depth tomorrow. I'm pretty sure that the direct algorithm I posted actually culls too much, so that you can see through the tiles near the screen edges. Either increase the screen size in all direction by half a tile or increase the size of the cull region when calculating iStart, jStart, e.t.c. Basically just decrease the minimums by 1 and increase the maximums by 1 (or 2 if it's a length depending on the minimum). You have a good eye. What you point out is absolutely correct. Limiting n and m to not go below their starting point is stupid (as I learned through testing). It prevents the algorithm to work as inteded. About culling too much, you're correct, sort of. The algorithm works fine but as you said it culls a bit too much for the block to perfectly surround the screen. These are fixed by simple adjustments to the screen size or jStart,iStart, mBuffer, nBuffer values like you said. Now this is all fine and good. And we have now answered my original question. 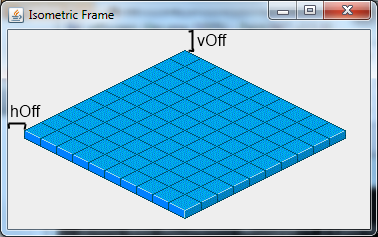 The correct Tiles are picked up from the 2D-Array to represent a screen in the isometric world. 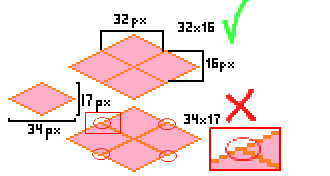 Re: [SOLVED] Drawing isometric tiles inside a screen ?? Maybe it's slower, but I've always just looped through the vertices of each space and any are onscreen then draw the whole diamond. Works fine. Well, all my logic is stored as if there is a non-isometric grid, i.e. isometric transformations are only applied to what is drawn to the screen. 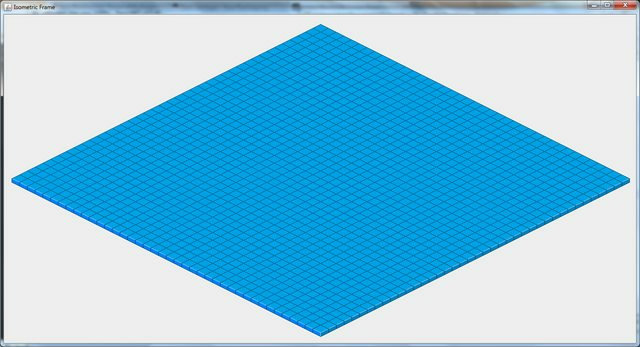 To do so, you can loop through all points in your grid, and do the isometric transformation on each point. Then draw anything that is onscreen. Granted that's not exactly how I do it, but you should get the idea. That is really ineffective. The number of checks is equal to the number of tiles on the whole map. The algorithm I proposed only draws the visible tiles in constant time no matter how big the map is. Yes, I said it was less efficient. I do stuff like caching the isometric transformations and the like, and you just end up with a few cheap comparisons each render. It's certainly simpler. Come to think of it what makes more sense than that is just translating the screen corners from isometric space into grid space, then you exactly have the indices you need to draw. Maybe that's what you guys are doing - I didn't really look at the code. Lawl well good on you. I do stuff like caching the isometric transformations and the like, and you just end up with a few cheap comparisons each render. It's certainly simpler. Hmmm. I use a method to calculate the Isometric X and Y position based on the 2D-Array every single time each tile is painted on the screen. Saves loads of computational power to simply have 2 additional values to store the Isometric x and y positions and only recalculate if it changes/movement occurs. Also glad that laying your thoughts out here (seriously, this is the most detailed thought laying I have ever seen on JGO ) helped you figure things out.